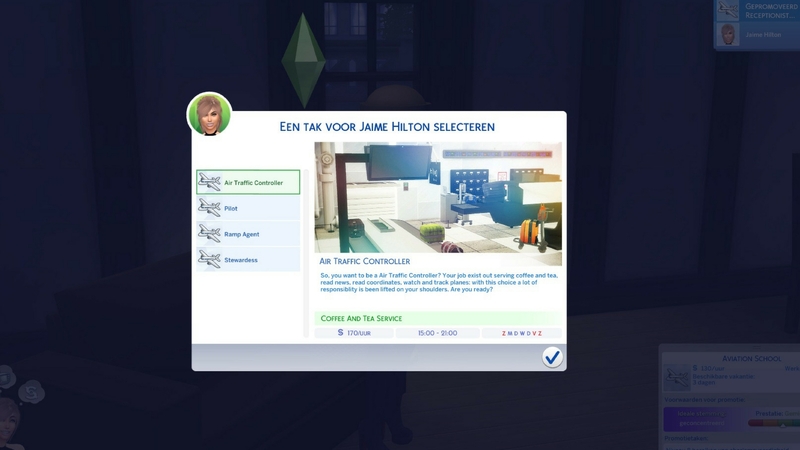 Custom careers - more choice for your working Sim! 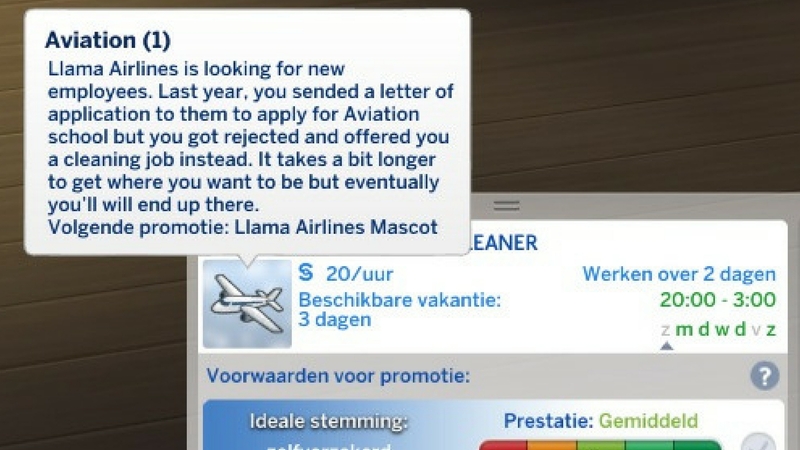 Llama Airlines is looking for new employees. Last year, you sended a letter of application to them to apply for Aviation school but you got rejected and offered you a cleaning job instead. It takes a bit longer to get where you want to be but eventually you’ll will end up there. As a Llama Mascot your job is to put smiles on the passengers faces and make them feel safe as they board the plane. On their way to the gate a lot of sims want to take a picture with you. Smile bright, be nice and be patient. As a Receptionist you answer phone calls, help passengers with their complaints and drink as much coffee as you want. Smile bright because nothing is more annoying to receive a complaint about your behaviour! Checking passports and make sure that every sim is sent off to the right gate is a big task. You manage to do a great job and your boss is really impressed with you and offered to write an recommendation letter for you so you can apply to Aviation School! Hard work pays off, you have been accepted to Aviation School. It time to choose your path, will you be a Ramp Agent, Stewardess, Air Traffic Controller or a Pilot? Your job is to repair small airplane parts like: seats, doors, toilets and many more what can be fixed by just a sim. You need to make sure that everything works and is safe for passengers to use. You do not want any complaints. Finally, you do no have to get your hands dirty anymore. Your job is to sort, collect and store lost luggage and get them by the right owner. Before all the luggage will be stored into the plane: you need to check them and collect them for the right flight. You basically can not make a mistakes, if luggage get lost you will be held responsible. Now you get to do the fun part and that is riding the truck. You also will be placing luggage on a treadmill and pick up new luggages from planes that have landed. You did it! You are a Ramp Agent. Your job is to guide planes to the right lanes and make sure that they land safely. It is an important task and mistakes are not tolerated. Your job is to plan, make, propose promotion ideas for Llama Airlines. You hand out flyers with the floorplan of the airport, safety rules and coupons they can use in some of the stores. Some days they will find you behind a desk helping visitors guide them to the right gate. As an Flight Announcer you announce when, where and how late flights take off. Your job is not that simple because a flight simply can be looked over. Make sure you do not forget one or else their will be angry visitors awaiting you. You are an Intern, which means you get to see what other Stewardess daily do and what it takes to be one. For now you won’t be put on any flights or other important task. You just get to watch. As a Ground Stewardess you get to check everyone's flight tickets and wishes them a safe flight. Sometimes you can tag along on a flight, these flights are only inland. You did it! You are a Stewardess. 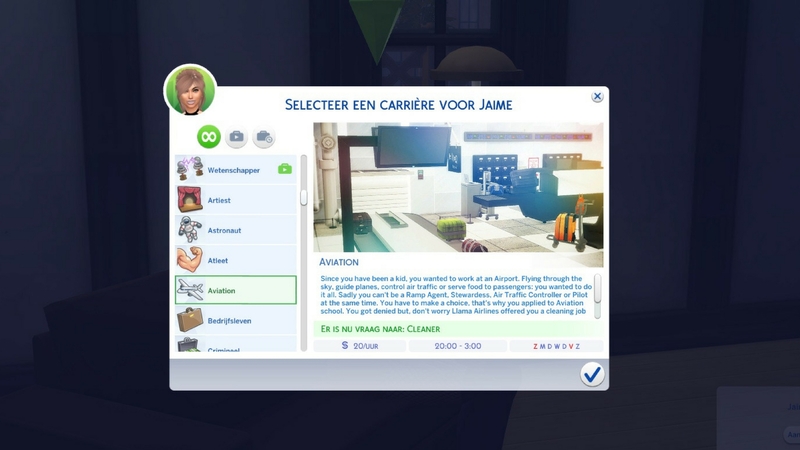 Your job is to make sims feel welcomed and safe during their trip. Put on your biggest smile and enjoy. Your first big task as an upcoming Air Traffic Controller is to provide your colleagues for Coffee, Tea and food. Most of them are spending night and days up there. Most of your days are filled in with cleaning desks, watering plants and vacuuming the place. As a News Reporter you check every hour the news about upcoming storms, missing planes and checking out new devices to make your job easier. In your free time you are working out a lot and train your brain for what is coming next in your career. Your job is to read Coordinates out loud so your colleagues knows which plane is high up in the air or low in the air. You need to be able to read maps and Coordinates that why you always going to school for an extra hour help. As an Radar Controller, you need to watch, track and read everything what is going on a Radar. If a plane goes missing you will be able to see that. If a plane has a problem you will be able to see that. You will be seeing a lot so being very focused is a key thing in this job. You did it! You are an Air Traffic Controller. Your job is to track flights on a radars and speak with the pilots to make sure everything is alright. If something is wrong you need to be quick: you need to let your team know and also contact the pilot to make sure he knows what is going on or knows what to do. On Flying School the only thing that you will be doing is flying and learn about all the switches in an airplane. You have to show them you are willing to do anything in order to become an Pilot. You are an Intern which means you will be doing almost the same thing as an Pilot. You will not be flying the big planes only the small planes who delivery cargo from San Myshuno to Windenburg and back. As an Radio-Telephony Reporter you are responsible for the walkie-talkie. Your job is to communicate with the Air Traffic Controller to know for sure you can take off safely, to find out if something is wrong with the plane and you will need to check in once in a while. You almost did it! You are a Co-Pilot. Your job is to examine everything a Pilot is doing and help them out when they ask you too. You also will be teaching and accompany interns to get the best out of them and prepare them for the big job. time you are helping others by giving fly lessons and presentations on schools to give them an impression what it’s like to be an Pilot.